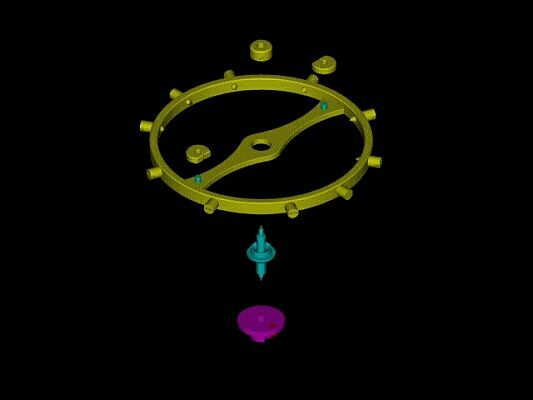 The balance wheel is the heart, the regulating organ at the essential core of any mechanical movement. It is something which has often been marginalized in its importance, surprisingly most often in the world of high complications where cost is no object, and timekeeping is often only a incidental function at best. Of the many distinguishing factors which separate the fundamentally highest grade of watchmaking from fine and commercial watchmaking, the freesprung balance is perhaps the easiest for the average enthusiast and collector to recognize, and the hardest to find. Unlike the overcoil hairspring which remains a hotly debated topic, the freesprung adjustable-inertia balance is unanimously acknowledged to be superior to all other forms of regulation, and as a technical expression of the craft beautiful in its purity and simplicity. The birth and evolution of the adjustable-inertia balance began it seems with the chronometer in the late 18th century, and it is the chronometer which exemplified and defined the concept of the high grade watch. 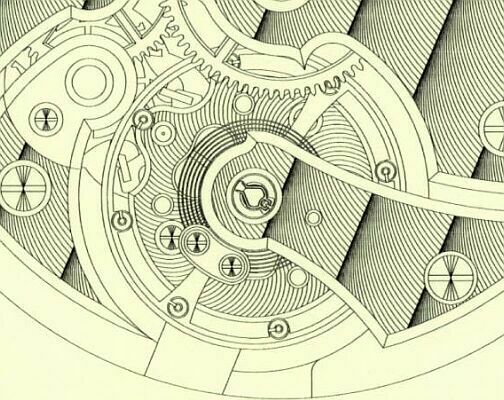 Chronometers – and by that I mean only watches with detent escapements – were historically the first watches where perfect accuracy was a priority of such weight that any element of design detracting from optimal performance would be corrected at any cost. This pursuit of excellence naturally extended itself to the connoisseurs of the contemporaneous pocket chronometer, if less urgently. The evolution of the adjustable-inertia balance over the centuries is nothing less than the horologers quest to realize a perfect circle. 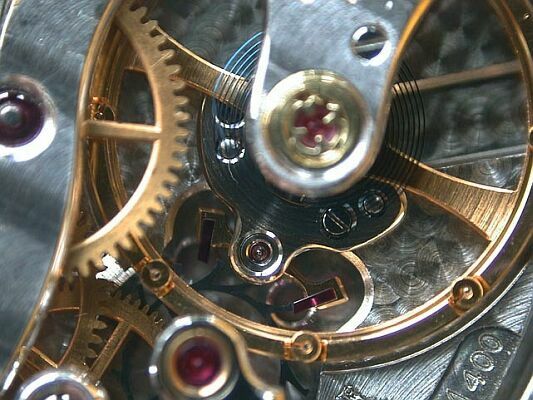 The fundamental distinction between an adjustable-inertia balance and all others, are the inertia masses which can be adjusted, usually in pairs but sometimes in trios, to regulate the rate of the watch without a conventional regulator and all of the performance problems a regulator creates. In their earliest and still most common iteration, these adjustable masses took the form of screws set into the outer edge of the balance rim. Not to be mistaken with the screws used for poising and for the adjustment of temperature compensation on bimetallic compensation balances, these “mean time” or “timing” screws were usually placed in-line with the balance arms. Timing screws were typically made of gold while the rest were made of brass, though on finer examples all of the screws would be gold. 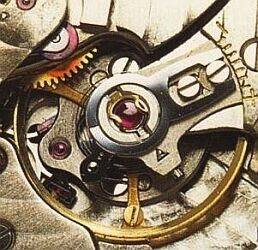 On some extra-fine examples which I have seen, the timing screws were made of platinum. 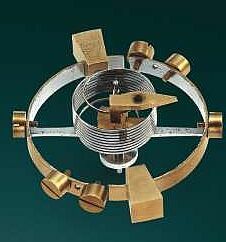 The split bimetallic balance shown above right is an example taken from an American marine chronometer, circa 1845, featuring a freesprung helical balance spring. 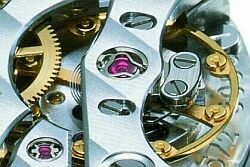 The technology of mechanical horology has advanced some since the days when this particular balance was patented: Split bimetallic compensation balances have been succeeded by monometallic Glucydur balances as steel hairsprings were succeeded by self-compensating springs like Nivarox. Naturally the engineering of the adjustable-inertia balance would evolve with this change in materials technology, and it is encouraging to find that new adjustable-inertia designs are finding their way to market seemingly every year. For the enthusiast seeking this special sign of high grade watchmaking, there are now many schools of thought and stages of development to study and choose from – if one knows where to look. What follows attempts to touch upon the most significant examples. It was Patek Philippe which set the stage for the modern monometallic adjustable-inertia balance used for the unprecedented mass production of high grade watches. 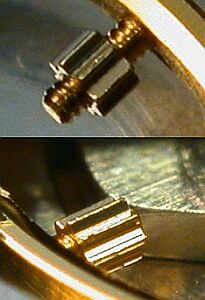 Developed from 1949 to 1952, Patek Philippe received two patents in 1953 for its Gyromax, “a balance with recesses in the rim each having a peg parallel to the axis of the balance and with sprung adjusting weights held centered on the pegs.” The original design and usage introduced as shown above had eight “Masselotte” inertia blocks inset directly into the rim, which maximizes the balance’s moment of inertia for the given diameter of the balance. Additional to this, there were six and four weight variants for smaller movements. In this format it was used by Patek Philippe, Audemars Piguet, and Vacheron Constantin; the Great Three of the pre-quartz era. The Masselotte weights could be used individually to poise the balance, and in pairs to regulate timekeeping, just like the poising screws and timing screws (if so equipped) of contemporaneous screwed monometallic balances, while fitting a larger diameter balance in the same available space than would be possible with a screwed balance. Over the past fifty years Patek Philippe has used the Gyromax extensively, in everything from 6 ligne women’s wristwatch calibres to 12 ligne men’s calibres, 17 ligne pocket watches, and 19 ligne table and wall clocks. It is unclear when the change occurred, but it seems that in the mid-to-late 1970s Patek Philippe switched to a new version of the Gyromax (shown left) with the Masselotte weights inset next to the balance rim and on the balance arms. 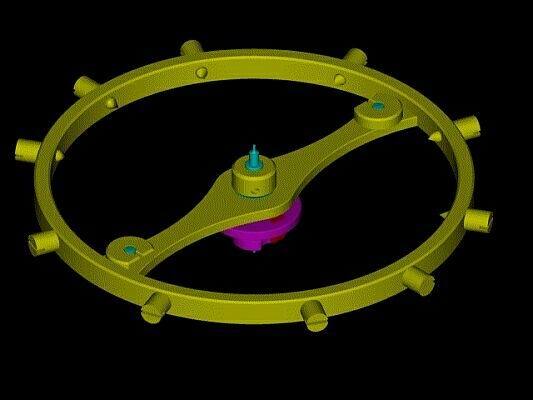 The simplest and most likely explanation is that this redesign may be less expensive to manufacture, though it places more mass closer to the axis, and thus reduces the balance’s potential moment of inertia. This is the standard Gyromax balance now in use by Patek Philippe on all of its mechanical calibres excepting only the 7 ligne calibre 16-250, which has a smooth balance and micrometric regulator. Audemars Piguet presently uses it for all of its 2120 based calibres, and its hand-wound calibre 3090. As the first wristwatch manufacturer to be obsessed with observatory certification, Rolex is no stranger to freesprung wristwatches. In 1914 it was the first wristwatch manufacturer to gain a grade “A” certificate from the Kew Observatory in London, and one of its first series of freesprung wristwatches were the Kew A certified Speedkings of the late 1940s and early 50s. Rolex also released a limited production run of Mk. 1 Datejusts in 1948 with freesprung screwed balances, in about 100 examples. It wasn’t until the 1950s that Rolex introduced in regular commercial production its freesprung 15xx series calibres. Rolex initially experimented with more than one type of adjustable-inertia balance. It appears that one was based upon the Gyromax, a simple smooth balance with two Masselotte-type weights on the balance arms. The other was the in-house designed Microstella, a screwed balance with timing screws of a novel design: These Microstella screws featured a flanged design which allow regulation with the movement in the case – like a rotatable Masselotte – but with the greater precision of adjustment of a timing screw. It appears that by the mid-60s Rolex favoured its own design which it continued to develop. Over time it was proved that Glucydur balances did not require the frequent re-poising of brass-steel bimetallic balances, so standard poising screws began to disappear from general use. 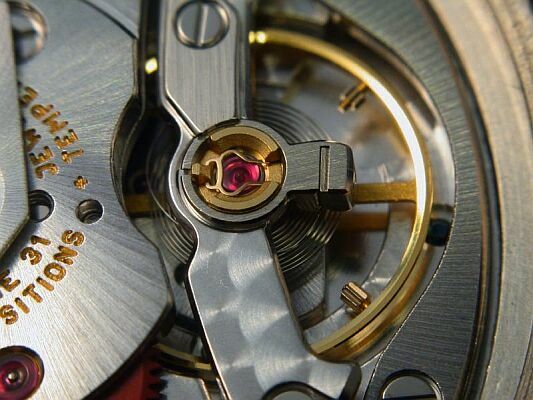 For most watches this meant smooth balances, and for Rolex it meant removing all but the four Microstella screws as their balance design evolved. To gain the advantage of maximum balance diameter Rolex would move the screws from the outer edge of the balance rim to the inner edge. In its latest evolution (shown above), the Microstella screws were replaced with nuts (shown above left), in two opposed pairs of different weights. The larger weights are used for greater adjustments of rate, while the smaller weights are used for final fine regulation. 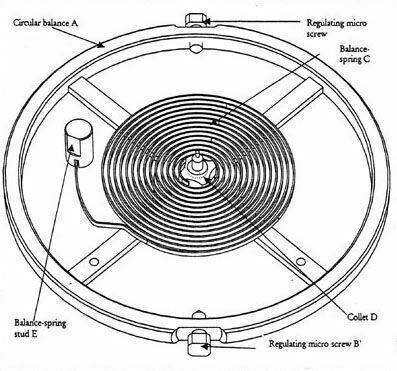 All mechanical Rolex wristwatches feature the Microstella balance, most with a freesprung overcoil hairspring. While Patek Philippe and Rolex are no doubt the most significant producers of freesprung wristwatches, there are a number of other brands with unique balance designs of interest to the connoisseur, some vintage and some which are recent introductions to horology. The “Adjustable Mass Balance” shown above is perhaps the most significant recent introduction, likely destined to become the second most common adjustable-inertia balance in mass production. It was introduced by Omega at the Basel Fair in 1999, largely overlooked in the fanfare of the new Co-Axial escapement, which it formed a very important part of. Omega’s design reduces the adjustable-inertia balance to its simplest form, using only two adjustment screws. 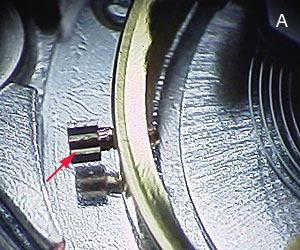 Like the Rolex Microstella, poising is obviously done by computer, and like earlier generations of the Microstella it suffers the theoretical disadvantage of having its timing screws placed on the outer edge of the rim, reducing maximum balance diameter. First introduced in a limited edition of 2000, it is now more or less in regular production, used in Omega’s Frederic Piguet based chronographs in addition to their Co-Axial watches. One would expect it to become universal in Omega’s mechanical watches in the years to come. Rising Fleurier manufacture Chopard intends to introduce a new balance of its own design late in 2002 or early 2003. The Chopard “Variner,” a contraction of variable inertia, will at first only be featured on the upcoming 8-day tourbillon calibre 1.02, based on the four-barrel 9-day calibre 1.98 introduced in 2001. As yet the new balance has not been unveiled by Chopard, and at least initially it will be an anomaly like the freesprung screwed balance on Blancpain’s eccentric 8-day tourbillon. However, if it should replace the swan’s neck and Triovis regulation used on their LUC calibres it will be an event of great significance to high grade mechanical watchmaking – especially if paired with overcoil hairsprings. Of vintage interest is the Elgin durabalance which was introduced in 1958 and used by Elgin until it went out of business in 1963. A wholly unique design in horological history, Elgin attempted to add shock resistance for the balance pivot in the structure of the balance itself. More successful was the adjustable-inertia balance introduced by IWC on their calibre 8541B (shown above right), a variant of which is featured on their new calibre 5000 and its derivatives. The three-arm balance featured three rotatable weights, which were used only for final microregulation. 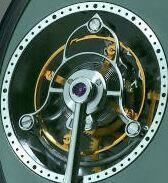 This balance was not freesprung by IWC, which used a regulator for gross adjustments in timekeeping. It is likely that Patek Philippe used the Gyromax this way as well during the first several years of its introduction, when it paired the Gyromax with swan’s neck regulation. Some early Rolex Microstella’s were likewise fitted with index regulators. While we might imagine that all independent watchmakers are obsessed with the fine details of freesprung balances and the like, but just like major watch manufacturers more don’t than do – particularly when it comes to wristwatches. Still, there are a few independent watchmakers who freespring their entire wristwatch production, first and foremost is the much celebrated cabinotier Philippe Dufour. F.P. Journe also uses freesprung balances on his entire watch production, including unique pieces, complicated pocket watches, tourbillons, and the production Octa series. Journe’s wristwatch balance is more-or-less of the Gyromax kindred, four-armed with a Masselotte-type weight on each arm (shown above left). Similar balances can be found in the pocket watches of other independent watchmakers from over the last few decades, including George Daniels.